Blurb: **Disclaimer: This book contains no acts of suicide and it does have a ‘Happily Ever After’** A soldier returning for mid-tour leave decides to stay with a cousin in Maine, after his fiancé leaves him for someone else while he is away at war. His cousin is going through his own devastation and is struggling to pick up the pieces and move on with his family. As they try to help each other through the pain, Shane’s path crosses Jenn’s and he soon learns that everything happens for a reason. Shane is a solider coming home for his leave. Only he has nothing to come home to. His girlfriend left him while he was in Iraq. She took his home and his dog. So instead of going home to North Carolina he travels up to Maine to visit his only family. In a chance encounter he meets Jenn. The two quickly grow attached, only for Shane to have to go back to Iraq leaving Shane wondering if Jenn will leave him too. Mummert’s growth as a writes is the one thing that really struck me throughout reading this. I liked her erotica series but was not in love with it. White Trash Beautiful rocked my freakin’ face off. Literally, my face just came right off. 😀 Suicide Note is another great one from Ms. Mummert. A story that I fell in love with and poured myself into. Jenn and Shane both have painful pasts which I think most readers can relate too. That’s the thing about Mummert she really gets humans. She writes complexity into her characters. When I first started this book I thought it was one of those romance novels that would quickly evolve into more erotica. It’s not. There is real romance here. And I loved it. The world that this book takes place in is the life of a military relationship and the toll that takes on a couple. I’m not a military wife but Mummert seems to get it. She pours emotion into the worries and fears that this couple faces because Shane chooses to serve his country. It’s not a relationship that I envy, even though they clearly feel deeply for each other. 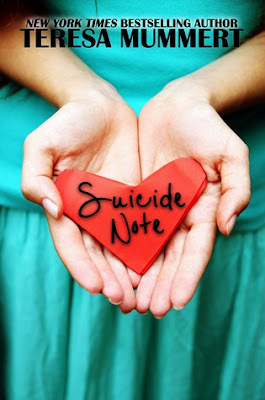 So where does the Suicide Note come from, and which character wrote it? Well telling that detail would be an epic spoiler. But the story truly is a HEA. And ok, so I may be a horror girl, and sometimes endings like this are too sweet for me. But I did enjoy this one very much. Overall I recommend this book for people who like stories such as On Dublin Street. It’s a little less intense sexually but emotionally deep. I was given an unedited ARC of this book in exchange for an honest review.This review is 100% my own and written by me.